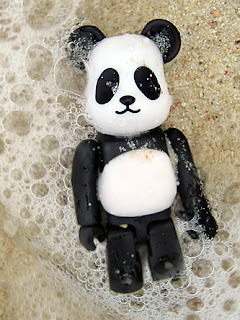 bearbrick love: plastics in paradise?! 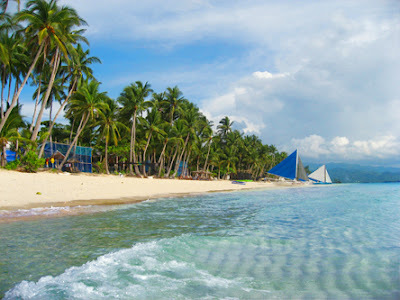 I just arrived from an out-of-town photo shoot in Boracay. At first, I thought it would be a nice junket – the location being one of my favorite beaches – until I took a morning stroll along the shoreline. My path was strewn with plastic waste, each piece half-embedded in the sand along with decaying organic debris, all washed ashore during the previous night. Everything from disposable lighters, rubber slippers, sunglasses, food wrappers, bags, water bottles and even hangers! See pics below, right. 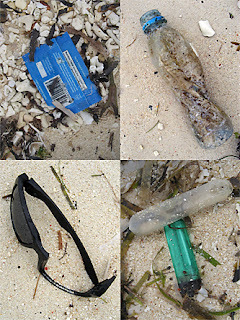 From afar, the non- biodegradable pollutants of the pristine-looking beach weren't discernible (below). But they were there – repulsive replacements of calcified starfish and corals that once adorned the long stretch of white sand. "Eat your own f__king trash if you can't dispose of them properly, you morons!?! *#?!" The WWF Panda Be@rbrick (top, left) was commissioned by the World Wide Fund for Nature, one of the world's largest and most effective independent organizations dedicated to the conservation of our natural habitat. Today, WWF operates in approximately 100 countries, supported by nearly five million people worldwide. To find out how you can help, visit their website here. I love this post, Ariel. I see you also bring your bearbricks with you to the beach. Don't lose them, they're plastic, too. Well said! This drives me nuts. The beach is my favorite place to be. It's rare to find one that isn't strewn with litter. I wish people would show more respect for the environment. It really makes me sad.